Once again, the field saw several spectacular performances by the Sooners, including one victory and 11 top-five finishes. Returning NCAA champion Tia Brooks opened her outdoor season in fashion breaking her own school record and throwing a career-best 61-05.50 (18.73m) to claim her 10th-straight shot put title of the 2013 season. 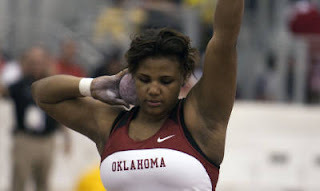 With the throw, she leads all NCAA shot putters, and is the first to surpass the 60-foot barrier, leading the second-best performance in the country by nearly four full feet. Holden Mitchell kick started the two-day event for Oklahoma with a personal best 192-11 (58.80m), fifth-place performance in the premiere hammer throw competition. The distance improves his standing in the record book, as he put together the third-best throw ever recorded by a Sooner. Freshman Austin Perry followed Mitchell in the open hammer throw competition, with a distance of 176-01 (53.67m) to finish fourth in the field. Perry continued his success on the field with a personal-best performance in the premiere men’s shot put competition that saw him record a 59-11.25 (18.27m) throw for second place. Although the distance is the furthest of his career, the performance maintains Perry’s rank in the record book, with the third-best throw in program history. In the women’s javelin competition a pair of freshmen – Avione Allgood and Elizabeth Herrs – combined to finish behind one another in the standings with throws of 162-06 (49.54m) to finish sixth and 154-10 (47.20m) to take seventh, respectively. Following their lead, a pair of sprinters in freshman Cessily Jones and junior Erin Jones found success on the track in their respective ‘premiere’ races. Cessily Jones finished fifth in the 100-meter dash after she stopped the clock in 11.80, and followed with a 10th-place, 24.33 performance in the 200-meter dash. Erin Jones finished right behind Cessily in the 100-meter dash with a time of 11.81 for sixth in the race, but bested the youngster in the 200-meter dash with a time of 23.75 to finish fourth overall. Junior Waymon Storey put together an impressive performance for the Sooners with runs in the 100-, 200- and 1,500-meter races, clocking personal-bests each time he stepped into the blocks. Storey began the day with a 10.51, fourth-place finish in the 100-meter, and followed with a 21.13 performance in the 200-meter premiere race to finish sixth overall. Fellow sprinter Jeremy Rankin made his outdoor debut this weekend with a 10.62 finish for fifth in the 100-meter premiere race. Also on the track were the hurdlers, where the duo of Tre’ Lathan and Matt Wicks took the second- and third-place spots, respectively, in the 110-meter high hurdles ‘premiere’ race. Lathan clocked in at 13.77 to take the runner-up finish, while Wicks crossed the line in a career-low 14.23 to finish third. The men’s 4x400-meter relay closed the competition with a third-place finish after Jamel Wood, Ethan Baker, Waymon Storey and Nathaniel Winfrey combined to stop the clock in 3:09.46. The Sooners will return to action next weekend in Fayetteville, Ark., for the John McDonnell Invitational, April 12-13. Women’s Shot Put (Premiere)1. Tia Brooks, Sr., 61-05.50/18.73m*!